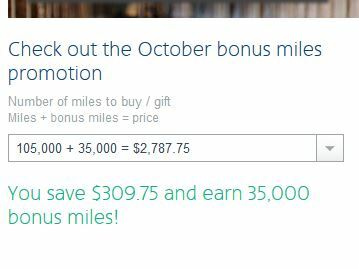 While trawling through the web for online deals for flights, I came across American Airline’s Buy Miles deal where for purchase of 100k miles, you get a 35k miles bonus and also a 10% discount on the cost, so is it worth buying for people who are based in Hong Kong? As a OneWorld partner, AAdvantage program allows for flight redemption on OneWorld airlines, given that I make at least 2 personal long haul holidays a year (one back home to Sydney and one to UK/Europe for a much needed holiday) and given that this year will be UK, I was exploring for tickets to Rome for 2016. This equates to about a cost of 0.155 HKD per miles, which isn’t super cheap, but definitely not regarded as expensive! 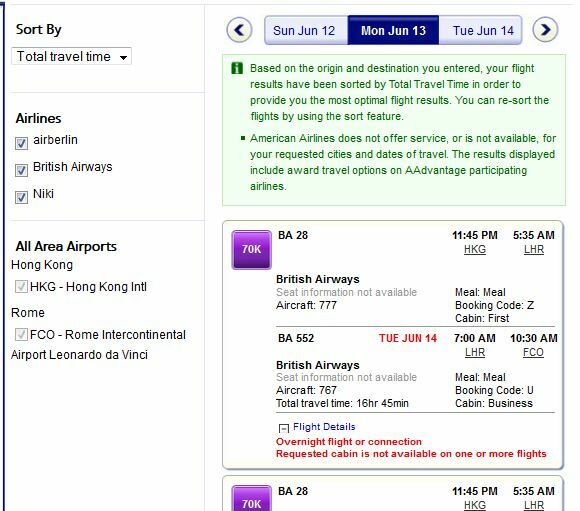 All up, it’ll mean that First Class return tickets from Hong Kong to Rome via BA will cost you 3,469 USD (2,788USD for the miles and 681USD of Taxes or 26.9k HKD all up). How does this compared to just buying the ticket via BA? 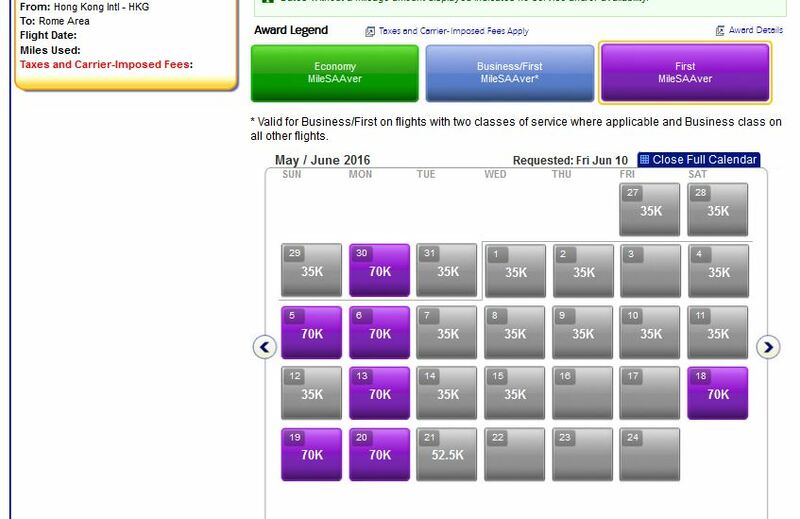 So with a bit of effort, you can be in pointy end at a price lower than business class. I checked and HK to LON is also 140k miles (you’re effectively getting the LON to Rome leg for free when you redeem miles) – this definitely makes it a lot cheaper than using companion tickets for First on Cathay (which was about 80k HKD). Obviously, if you HAVE to travel on certain days, then sometimes buying a ticket is always the only thing you can do. So whilst there are some “Conditions”, they are by no means difficult to work around – obviously, it’s not one size fits all, and you can always use the bought miles as an alternative to cheaper business tickets. Previous postWhy Asia Miles companion tickets makes more sense.